All that is good begins with a HEALTHY SMILE!! When you visit our welcoming newly remodeled NE Portland dental office, your healthy smile is our top priority. Our entire team is dedicated to providing you with the best, personalized, quality dental care that you deserve. 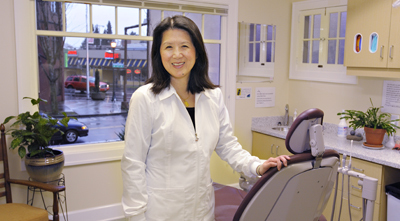 Dr. Chang has been a Portland general dentist since 1986. She has been listed as a Portland Top Dentist since 2008 in the Portland Monthly Magazine. We are located in the convenient inner northeast Portland in the Hollywood district. We genuinely hope this site is helpful to you in learning more about our practice, dental conditions and treatments, dental recommendations, and more. If you are an existing patient and would like to provide a review of our office please use our convenient link to Google plus and Yelp. If you are considering joining our practice, please look at our reviews from our existing patients provided by Rate A Biz on our website. Portland Dentist, Dr. May Chang is a dental professional dedicated to General, Family & Cosmetic Dentistry such as Dental Exams, Cleanings, X-rays, Fluoride, Dental Makeovers, Teeth Whitening, Veneers, Crowns, & more. Please come and visit Portland, OR dentist May Chang, DDS.